Critically endangered South American forests thought to be the result of climate change were actually spread by ancient communities, archaeologists have found. 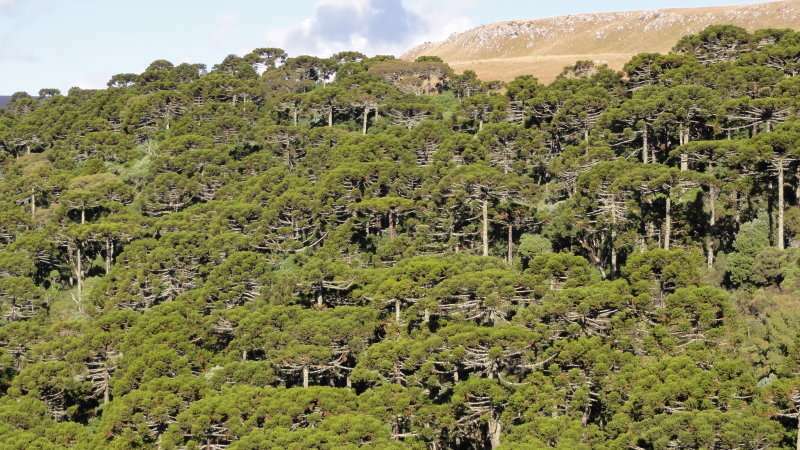 Huge swathes of land in Chile, Brazil and Argentina are covered with millions of Araucaria, or monkey puzzle trees, thanks to people planting or cultivating them more than a thousand years ago, a new study shows. Recent logging means the landscape is now one of the world's most at-risk environments. It had been thought the forests expanded due to wetter and warmer weather. But the research shows the rapidly expanding pre-Columbian population of South America, Southern Jê communities, were really responsible. New excavations and soil analysis shows the forests, still hugely culturally and economically important to people living in South America, expanded between 1,410 and 900 years ago because of population growth and cultural changes. Dr. Mark Robinson, from the University of Exeter, who led the British Academy and AHRC-FAPESP-funded research, said: "Our research shows these landscapes were man-made. Communities settled on grassland, and then—perhaps because they modified the soil, protected seedlings or even planted trees—established these forests in places where geographically they shouldn't have flourished." The forests date back to the period when dinosaurs roamed. 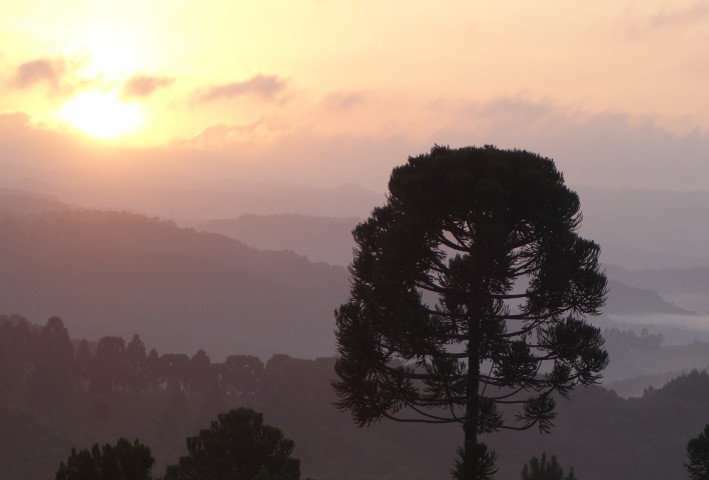 The iconic monkey puzzle tree, or Parana pine, has grown in the region for thousands of years. Its nuts were one of the most important food sources for ancient communities, attracted game for hunting when nuts were ripe. They were also a valuable source of timber, fuel and resin, and became an integral part of southern Jê cosmology. Communities still call themselves "people of the Araucaria", and hold festivals to celebrate the forests. 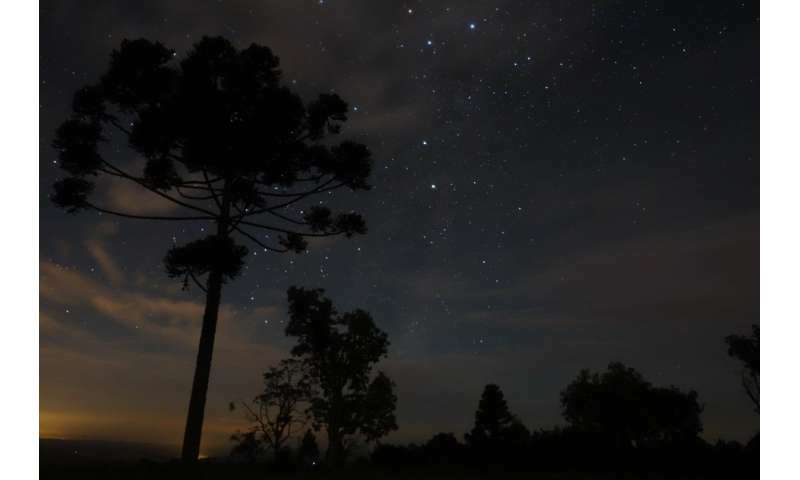 Of the 19 species of Araucaria tree, five are classified as endangered and two, including the Brazilian Araucaria angustifolia, are critically endangered. Reports from the late 1800s describe trees with diameters of over 2 m, reaching 42 m in height. Modern trees are only around 17.7 m tall. The archaeological analysis began because the experts, from the University of Exeter, University of Reading, University of São Paulo, University of New Mexico, Universidade Federal de Pelotas and Universidade do Sul de Santa Catarina, noticed that in areas of low human activity forests are limited to south-facing slopes, whereas in areas of extensive archaeology, forests cover the entire landscape. They were able to analyse soil isotopes reflecting vegetation and archaeological evidence from Campo Belo do Sul, Santa Catarina State, Brazil, to test whether this pattern was directly related to past human activity. The study shows the forests first expanded around 4,480 to 3,200 years ago, most likely near streams, and this may have been caused by a wetter climate. But a more rapid and extensive expansion across the whole region later happened between 1,410 and 900 years ago, when forests expanded into highland areas. The weather during this time was dry and less humid. This expansion of the forests coincides with population growth and increasingly complex and hierarchical societies in South America. The expansion in forests reached a peak around 800 years ago. The number of people in South America declined 400 years ago when European settlers arrived in the area. The population did not begin to recover until the 19 century, when loggers began exploiting the Araucaria forests for timber. Professor José Iriarte, from the University of Exeter, another member of the research team, said: "This study shows the Araucaria forests were expanded beyond their natural boundaries, they were used sustainably for hundreds of years, and conservation strategies must reflect this so they balance protection, heritage and economic development." Uncoupling human and climate drivers of late Holocene vegetation change in southern Brazil is published in the journal Scientific Reports.